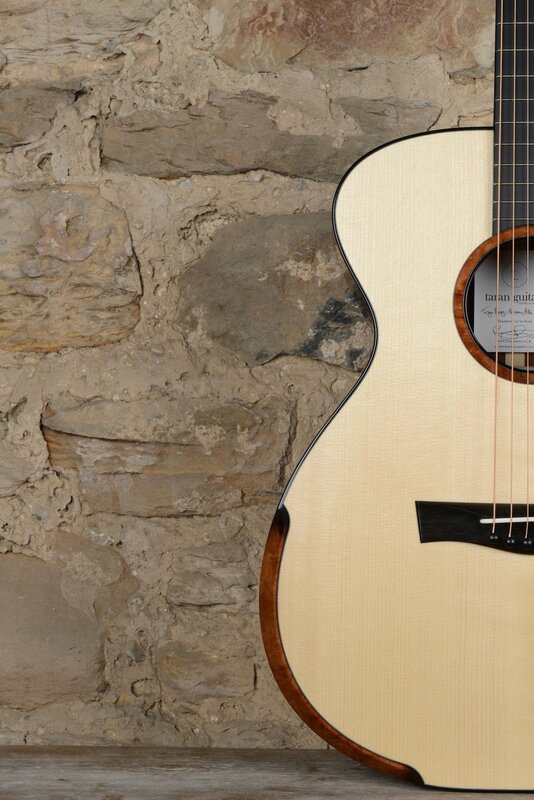 "Observing the whole process of building the guitar from start to finish was a real privilege. The range of skills required and the attention to detail was amazing. Helping out with one or two of the simple jobs was a bonus…..but the really unique part for me was the planning. I got to play some of Rory’s guitars and look at pictures of his back catalogue. Rory got to know my style of playing, the sort of sound and the aesthetics I was looking for. He put all this together and the end result is superb: international tone woods with some local burr wood detail - beautiful tone and plays really well." Back & Sides - Beautiful 4 piece Belizean Rosewood. Sound board - Master grade Adirondack. Neck - Old medium dense reclaimed Mahogany. Ebano Bindings with Scottish Sycamore purfling made inhouse . Crail Elm for the rosette and Bevel. Bevel with hot sand fade. Gotoh 510 tuner in silver with black buttons. Ebony hand carved bridge with ebony pins. Headstock faces in book matched Madagascan Rosewood and black veneer below. Sterling Silver hand cut t.